Update 25 July 2016 :no K2 summits in 2016 due to weather and snow conditions. With 112 permits issued for K2 the summer of 2016, the press will soon go wild with articles saying “K2 is the New Everest.” Never mind the fact that in the year ever, K2 saw about 50 summits and in a “normal” year, Everest will greet over 500 on the summit. With my 2014 summit of K2 and 36th major expeditions including four on Everest and two on Lhotse, my honest assessment is that K2 is not Everest. As anyone who has read my blog for the past decade can attest, I have utmost respect for Everest and her climbers. After all, it is the highest mountain in the world! But K2 is totally different. And it starts steep and ends steep! Near Camp 1 on K2 in 2104. Image by Alan Arnette. All rights reserved. These are a few reasons why K2 may never become Everest, but I’ve learned to never say never in this sport! With all due respect to Everest, there is little actual “climbing” by the normal routes. By that I mean using your hands and feet to maintain balance and move higher, other than on aluminum ladders. It is mostly walking on moderate snow slopes attached to a fixed line. There are exceptions in spots such as Steps on the North, the mid part of the Southeast Ridge on the South and on the rarely climbed more technical routes, mainly from the North. That said, Everest is not easy and should never be taken lightly as evidenced by the 5 deaths this year that, by most counts, could have been prevented. And in 2014, 18 Sherpas were killed from an ice serac release onto the Khumbu Icefall. But in general, while Everest is all about attitude, K2 is all about climbing. Even tho K2 is lower than Everest by about 800 feet, the climbing presents an entirely different level of difficulty, complexity and needs for skills. Each climber must has proven, long term skills in rock, ice, snow. Falter on one, you gamble with your life. The fixed ropes are mostly a placebo, some showing the route but others not strong enough to stop a fall. You actually rock climb using hands and feet, look for hand holds, literally use your upper body to ascend using a jumar. You use the front points of your crampons, not for traction on a snow slope, but to secure your body to a vertical ice or rock wall. It is a game of tiny edges, of inches. Your body is supported by your feet, your hands prevent you from falling backwards. If you slip on loose rocks and are not properly secured, you will fall and die. There is no recovery opportunity. Climb K2 is about as serious as one can get and at severe altitude. Crossing the Traverse on K2 at at 27,320 feet/8300 in 2014. Image by Alan Arnette. All rights reserved. And the descent is in some ways worse. You must rig rappel (or abseil) over and over, each one must be perfect, there is zero room for error. There is a maze of old ropes on K2 that need to be cleaned up. If you choose the wrong rope, and you slip thus weighting the rope, it will break under your weight. You are exhausted, the lack mental focus is very real so mistakes are easy and often. No one can climb for you, you are on your own, totally responsible for yourself; no guide, sherpa, teammates or porter can climb for you. You must be constantly on the outlook for large, as in microwave size, falling rocks that can kill you instantly. Avalanches are a constant threat. Down Climbing K2 Houses Chimney in 2014. Image by Alan Arnette. All rights reserved. Before I get comments citing other 8000ers or other mountains around the world with tougher routes, I fully acknowledge that sections of Nanga Parbat, Makalu or true rock climbs like Meru, Fitz Roy offer similar and significantly more difficulty to sections of K2. I am positioning K2 with Everest by the ‘normal’ routes that most readers might consider. Pakistan and Nepal/Tibet have very different levels (and availability) of High Altitude Workers. There are Sherpas in Nepal, Tibetan Sherpas in Tibet and High Altitude Porters (HAPs)in Pakistan. Clearly the Sherpas are the known as they have been supporting foreign climbers since the early 1900s. There is a school in Lhasa that has trained many Tibetans and today they fix the rope on the north side. In Pakistan, there are a limited number of highly qualified and skilled HAPs but there are efforts to train more. Many expeditions bring Sherpas in from Nepal to support their teams and fix ropes on K2 (and Broad Peak, the Gasherbrums, etc) and Pakistan doesn’t like this at all. Each Sherpa must have a full price climbing permit and there have been discussions to ban them as they are viewed as taking the jobs of the HAPs. All of this results in higher prices for Pakistan climbs, but they are still less expensive than Everest. A permit to climb K2 is around $1,700 versus $11,000 for Everest. Thankfully a ban on Sherpas has not happened as the Sherpas and HAPS work well together and a transfer of skills is taking place faster than if the HAPs climbed on their own. Personally I think having more local support in Pakistan is good for everyone, but they need to have the same skills as the Sherpas if more inexperienced climbers continue to attempt Karakoram peaks. From 1986 to 2015, there were 11 years with no summits. From 2009 to 2015, there were only three years with summits – 2011 only from the Chinese side, and 2012 and 2014 each with about 40 – 50 people summiting – record breaking years as a result of a week of excellent and rare summit conditions. Everest went from 1974 to 2014 with summits every year – 40 straight years! K2 sits to the West of the other large Karakorum peaks thus takes the brunt of the west to east weather fronts. The weather has been notoriously difficult to predict and many deaths have occurred as a result of weather “surprises”. Around 287 people have died on Everest with about 7,500 summits ~4%. On K2 86 deaths for 375 summits ~ 23%. The leading cause of death on K2? – the climber “disappears”. On Everest it is from falls. There are several reasons the death rate is higher on K2 including lack of helicopter rescue, bad weather and given the relatively few people climbing it, there are limited resources to help in a rescue. However in 2008, Pemba Gyalje Sherpa, was personally responsible for saving three lives after the serac released. Eleven people died that season – the worst ever on K2. Run by the Pakistan military, it can cost $30,000 to get a helicopter to and from K2 Base Camp – if they can fly in at all given the poor weather. Compare this to the over 50 rescues this past spring on Everest at a cost around $3,000. Forget about getting a chopper to a high camp on K2 – they don’t have the specialized helicopters to perform at those altitudes. For many spouses, this is a show stopper that in case of an emergency, their loved one is trapped – potentially forever. 80 miles on the Baltoro versus 30 in the Khumbu- that should say it all. But there is more – no teahouses, no trees! Walk on a very uneven glacier. Temps range from 0F to 100F – all in all a trek on the Baltoro Glacier is not a tourist event but rather a necessary evil to reach the mountain. AND the trek to K2 and the other 8000er base camps is absolutely beautiful; in terms of mountain vistas. Superior, in my opinion, to the trek to Everest Base Camp and regular readers know I love that trek. Video by Alan Arnette. All rights reserved. Why K2 is becoming more popular? With all these reason, you might think K2 will remain the domain of the professional climber, but that would be a mistake. The trite saying goes, “Summit Everest and you earn bragging rights. Summit K2 and you earn respect.” I believe anyone who summits either deserves both, but that is for another post! Less than 200 have summited both K2 and Everest. Commercial expeditions have been going on as early as 2000’s by several companies including Austrian Kari Kobler. In recent years, Seven Summits Treks has run regular trips attracting as many as 30 climbers each season. Himalayan Experience and Madison Mountaineering have also run trips applying their Everest formula to K2. Use of supplemental oxygen used to be rare, but now it is used by the vast majority of K2 climbers. Climbers themselves used to set the ropes, now even the sponsored and professional climbers use the ropes set by Nepali Sherpas. Weather forecasting has improved but there are still surprises. K2 base camp is now filled with large dining tents, small projectors showing movies from laptop computers and excellent meals prepared by both Nepali and Pakistani cooks. Unlimited Internet has become the norm as well. While not quite as dramatic as depicted in the bad movie Vertical Limit, at times today’s K2 Base Camp gets very close. With 112 permits issued, K2 will see more climbers this year than in any previous season. The high camps of C1, C2 and C3 are tiny and can support less than 10 tents so the potential for conflict is high unless all the teams work well together. With so many people, the job of fixing the route with ropes should be easy but as usual with so many people, the common behavior is to wait for someone else to do the hard work, again a potential conflict. This year there are several commercial teams with members who will depend on guides and Sherpas just like on Everest. This is not all bad as the “Everest Formula” has opened up a world to a new demographic. The bad part will be when just like on Everest where members, seduced by slick marketing and tales of safety and success by guides and local operators, die not knowing how to be self sufficient. Sadly, one death has already occurred in the Karakoram this summer. Italian alpinist Leonardo Comelli, 27, died while attempting the first ski descent of Laila Peak on 9 June. My condolences to his family, teammates and friends. Best of luck to all teams on all mountains. note: all images are the property of alanarnette.com and not to be used without permission. K2 climbers must have much better skills and experience so the death rate is understated relative to Everest. Start adding in anything less than the best of the best that attemt now and the death rate will surely increase. I too do not think that K2 will become the next Everest. Like you say, they are two totally different mountains and need different experience to climb each one. Lets hope the season on K2 will be a safe one. Anyway, on a more serious note, we’re in agreement on whether K2 is ever likely to become Everest. You are right to keep highlighting the seriousness of K2, as I believe there are a few people who cast their eyes at it without appreciating the scale of the step up from Everest and other 8000ers. 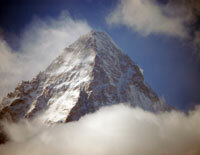 I had an enjoyable expedition to the Gasherbrums a few years ago, and G2 is still unfinished business, but as for K2? Not on your nelly, as we say across the pond. I missed your post so no forgiveness is necessary! However I just read it Mark. Well done as usual. And yes I still am proud to have climbed on behalf of Alzheimer’s (donors contributed $70K to research) AND I’m very grateful to have summited. K2 is not for everybody. To climb it requires experience and a solid understanding of purpose.